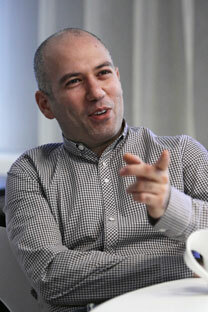 The 32-year-old Denis Sverdlov, head of Skartel, Russian company which operates Yota brand, is upbeat about 4G networks. Denis Sverdlov: Yes, we have only existed for one year, but our network already covers five Russian cities with 1,000 base stations in Moscow alone. No other 4G service provider has built their network as fast as we have. In Moscow we are installing over 100 new base stations per month. Our main objective is to develop the network rapidly. What was it that triggered your turn towards the international market? Denis Sverdlov: In order to dominate 4G – this completely new sector – we immediately assembled a solid team with a lot of expertise. It is important to note that it is a totally different model of service consumption. The network’s architecture is very specific. We have mastered 4G and have become one of the biggest networks in the world. Eventually, we understood that this knowledge and this expertise were exportable. Russia regularly exports its raw materials, the Bolshoi, but that is why our position is unique. Denis Sverdlov: We were interested in Central America because the population density there is very high with 50 million people. The population density was crucial for us. Even in poor countries there is a good percentage of the population – 10, 15 or 20% – that can purchase wireless Internet, a percentage that is growing rapidly. Governments in these countries are hurrying to attract foreign investment and to develop their economies. The telecommunications sector is a key sector for their development. They have not had any money to develop standard infrastructure and for that reason, are interested by the latest technologies. That is why we get massive support in those countries. Do you intend to enter bigger or more developed markets? Denis Sverdlov: Everything depends on the position of closed regulators that favour local players. Obtaining a license is extremely expensive in India, for example. The important indicator for us is the per capita cost of the license. From that point of view, neither India nor China is very attractive. In Europe, existing providers are very strong and regulators more or less close the market to new providers. The cost of a 4G license is huge, and even dominant local providers are not always able to buy them. This really slows down the development of this technology in larger countries. It is simply too expensive to be profitable. Who are your shareholders and what is the source of the funds that have allowed you to expand so rapidly? Denis Sverdlov: The Telconet investment fund controlled by Russian businessman Sergei Adonyev holds 74.9%. Russian Technologies holds 25.1%. In the beginning, and typically enough for a type of project like this that is based on new technologies, it was our own shareholders who came up with the financing because they believed in the project. Since October 2009 when our sales overtook expenses and we were becoming well known, we have received offers from major banks as well as from companies who sell us equipment. The biggest bank that put its trust in us is [state-controlled bank] Sberbank, that has already loaned us between 70 and 80 million (dollars?). We are also in negotiations with French and British banks. How is your debt managed? Are your profits sufficient at this point to make repayments on schedule? Denis Sverdlov: Our company is currently profitable. At this time we are able to repay a large debt from our profits alone without difficulty. We have a $200 million debt to shareholders, plus $100 million to banks, for a total of $300 million. We forecast revenues of $300 million in 2010 and, thanks to this figure, we are in a position to settle our debts. Is the involvement of the state corporation Russian Technologies a plus for you? Denis Sverdlov: It’s a big company that really helps us to develop Russian technology here and abroad. They have a very large presence in most countries around the world. It’s a network that we can benefit from. They have 46 branches in the world and are a very big help when it comes to international expansion. They also help us in the domestic market since our growth is heavily tied to the construction of new infrastructure. This kind of project is much simpler when it receives support from local authorities, which is what RosTech was able to ensure. What led to your move from the WiMAX standard to LTE? Denis Sverdlov: We’re not abandoning WiMAX. In cities that already have WiMAX, we will keep this standard. We will install another 1,000 WiMAX base stations this year. On the other hand, all future cities will be equipped with LTE. We are satisfied with WiMAX, but this standard only works well with portable computers and not with mobile telephones, which are no less important to us. Mobile telephone manufacturers (Samsung, Apple, Nokia) don’t want the WiMAX standard. The move to LTE is an industry choice, not our own. Are you thinking of a merger with a fixed service provider? Denis Sverdlov: No. We believe that with the expansion of the network and higher speeds, wireless Internet will eventually replace cable. While much of the world is still rolling out the third generation (3G) of mobile networks, some countries have already moved on to the fourth (4G). Russia offers an intriguing example. Yota, a start-up with no old voice business to protect, has built a 4G network from scratch, burying 3,000km (1,864 miles) of fibre-optic cables to connect its wireless base stations. The firm is ambitious: it hopes to establish a global brand.